Stun Master 12 Million Volt Stun Batons – The rubberized coating ensures a firm grip and the strips down the barrel of the stun baton release a hellish shock to anyone trying to take the baton from you. It is rechargeable and has a super bright 3 function flashlight with 3 modes: a high beam, low beam, and strobe. The baton has a wrist strap with disable pin that prevents the stun gun from functioning if the baton gets taken away from you during an attack. Includes wrist strap disable pin, wall charger, and nylon holster. 4.6 milliamps depending on the charge of the battery. 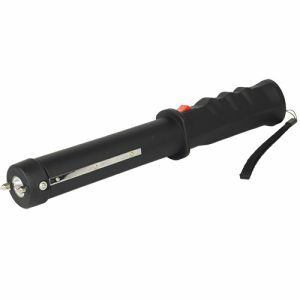 Powerful 4.5 milliamps stun baton, flashlight with 3 light modes and strobe.